February 16th, 2010 by KTU | Filed under 1. Planning and Design, Notes on Approaches. In this post I explain the analysis I did to understand energy efficiency design issues in my new house. By basic form, I mean what shape does the house have, how many stories is it, and how much window area is there. Those factors matter quite a lot. The most thermally efficient shape (ignoring solar factors) has very little surface area relative to its volume, basically a cube (if you assume the surfaces will be flat not curved). 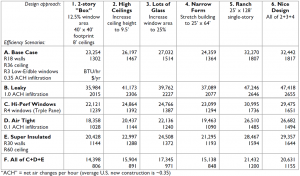 In the analysis I did, I assumed for a base case, a 3200 sq-ft 2-story house, with 8′ ceilings, on a 40′ x 40′ footprint. That’s a pretty boxy shape, but quite efficient thermally. Windows are wonderful, except that they have just terrible thermal performance, even the really fancy ones. So, you basically have to decide how much glass you want and trade that off against how much energy you are willing to lose. About 12.5% of the wall area on an average new home in the U.S. is windows. I assumed that value in my base case. OK, that boxy house with average windows in it will lose about 23,000 btu/hr keeping the inside at 70F on a 30F day, a typical heating day in climate zone 6, where I’m building my house. Note that this is not the maximum required heating capacity, which would actually be about 40,000 btu/hr for the -7F design temperature used to size boilers in zone 6. If you assume 200 days a year of 30F weather you get 8000 heating-degree-days, which is pretty close to the actual value for my location. But what about energy efficiency approaches like super insulation, reduced air infiltration, and fancy triple-pane windows? Those all help. Moving vertically down the table, I show what happens when those approaches are applied to each of the basic forms. Just to emphasize how important air infiltration is, I show as Scenario B what happens when you build a “leaky” house. By the way, an air infiltration level of 1.0 is not that hard to stumble into. If your builder is sloppy, you can easily suffer from that kind of air flow. 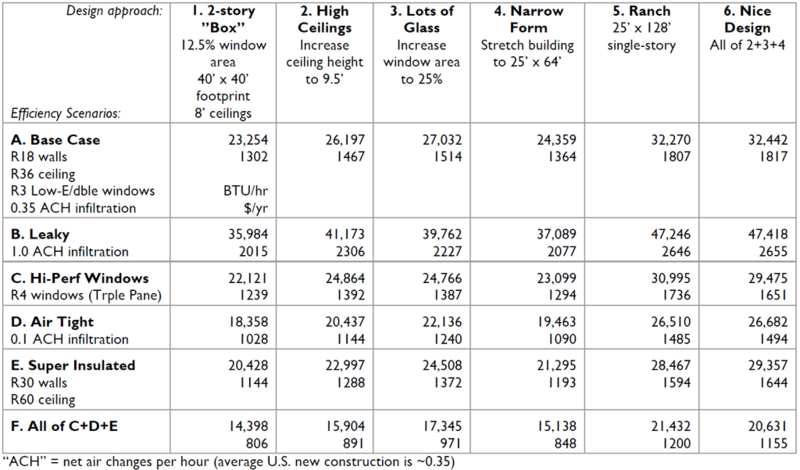 The baseline value of 0.35 ACH (“air changes per hour”) is the average for new construction in the U.S.
Heat load and annual energy cost for different design scenarios. Personally, I would only build a long narrow house, because I value natural light a lot. I would also never build a house with less than 20% window area, and preferably 25-30%. So, I start from that position, which I label “Nice Design” in the table. Then, the question is, how much are you willing to spend on fancy windows, reducing air infiltration, and super insulation? This table gives you a sense of how much you’ll save in annual heating costs for each of those steps. I won’t be buying triple-pane windows, but I will build a very tight house. In a future post, I’ll discuss approaches to doing that. Here is a one-page PDF document containing the summary table along with the key assumptions. If you really want to do the deep dive, here is the spreadsheet I used to generate this table. Go wild. I’m an architecture major and I am really enjoying reading your blog, I grew up outside of Jackson Hole and am very familiar with much of the points mentioned in your blog, specifically the one regarding design cliches with every new cabin looking the same. I can’t wait to read more of your blog and from the photos I have seen on CLB’s website your finished product looks outstanding! 02/20/2010: Walls are only about 60% insulated. 02/09/2010: Lowering the Side Entrance by 4 Ft.
Wiki containing architectural and structural drawings as well as subcontractor information.